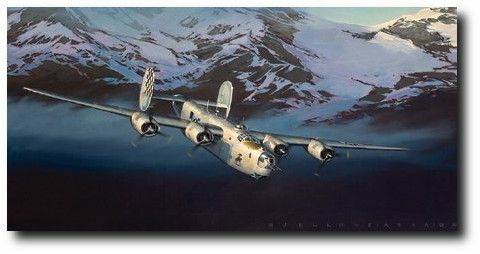 Image Size: 33.25" x 16.5"
Paper Size: 36" x 20.5"
Canvas Size: 33.25" x 16.5"
First Lt. Carl H. Fritsche levels his fuel-laden Consolidated B-24 Liberator, nicknamed "The Crusader," between cloud decks over a valley in the Himalaya Mountains between India and China. Unable to climb above the high mountain peaks because of their heavy loads, the B-24 crews relied on the skills of their navigators to guide them through the valleys and more often than not, through terrible weather (Over the HUMP.) Fritsche and his crew made 48 successful Hump flights carrying vital fuel supplies for General Claire Chennault's aircraft. Fritsche's Squadron, the 492nd Bomb Squadron of the 10th USAAF, was temporarily assigned to Chennault's 14th USAAF in China during the period of August and September 1944.